You’ve most likely heard most of these simple polymer clay tips and tricks before. But then again, maybe not. It’s never good to be that guy who’s standing there saying, “Whoa, I can’t believe nobody ever told me that!” It’s always better to be the guy standing there nodding his head saying, “Yup. Knew that.” So, with that in mind, here you go! 1. Hand Sanitizer cleans clay residue off your hands. 2. Cornstarch is your friend. This one has several uses. Cornstarch makes a great mold release for molds and texture sheets. A bit of cornstarch on your finger is great for smoothing the fingerprints off of your clay creations. And finally you can bury your beads in a bed of cornstarch when baking to prevent the clay from browning or scorching. 3. Nail polish, spray paint, and solvents will cause sticky polymer clay. 4. You can change the texture of polymer clay. 5. Most Important of Polymer Clay Tips: You really do need an oven thermometer! They’re less than $10 at a kitchen supply store or even WalMart if you’re lucky. And they’re indispensable! Even if you’ve been baking in your oven for years without a problem, that doesn’t mean that it’s accurate. And when it comes to clay, accuracy counts. You’ve got to bake it long enough and hot enough to get a full and complete cure. Otherwise your project will be spongy and brittle. On the other hand, some brands of clay are very susceptible to burning and high spikes in temperature might not hurt your casserole but it will completely toast your polymer. This is part of getting to know your oven so that it can be your friend and give you very good results. Read all about baking polymer clay here. 6. Sharpie fades on polymer clay. I see Sharpie Markers recommended in tutorials all the time and I have to tell you…don’t do it. Sharpie markers are a great little tool and I love them for all sorts of crafts. But Sharpies are a solvent-based dye based marker. And that means that over time the dye will diffuse into the polymer, creating a “blur” or bleed. Use a pigment based marker instead, such as PITT Artist Marker or Microperm markers. See the article What’s the Best Pen for Drawing on Polymer Clay? 7. Store polymer clay in Ziploc sandwich bags. Polymer clay can react with and dissolve some plastics. But plain old Ziploc sandwich bags are polymer clay safe. Plus you can zip the bag shut, keeping out dust. And if you’d like, you can label the bag with a Sharpie, removing all doubt about what brand of clay you put inside. Read my article about what plastics can be used to store polymer clay. 8. Use white scrap clay to clean your hands and pasta machine. 9. Crumpled aluminum foil makes a good bead core. When making a large bead or a large figurine, you save both clay and weight by using crumpled up aluminum foil as a core or armature. Just crumple it tightly and then cover it with clay, then bake. 10. To avoid bubbles, put clay fold first into the pasta machine. Are you finding bubbles in your polymer clay after conditioning it with a pasta machine? Bubbles are bad because they will expand during baking, creating an unsightly lump in your work, often ruining a piece. When conditioning clay, try inserting your folded over sheets of clay into the pasta machine fold side first. That way air doesn’t get trapped inside. If you do get a bubble, just slice into it with your razor blade and then press the air out, sealing the hole shut with your fingers. 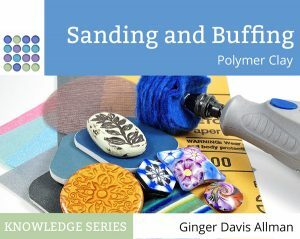 Want more polymer clay information? Subscribe to the monthly newsletter and get new article announcements. Do you love polymer clay and are hungry for new projects? 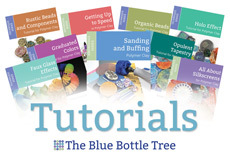 Come check out my popular polymer clay tutorials and eBooks that cover a variety of subjects. Each one is beautifully and professionally formatted, delivered immediately in a file that is read on any device, even your phone. That makes working in your studio super easy. Thanks for all these tips, really clearly written, did know some, but not all. Most surprised by the Sharpie issue. Can I mention a tip I was given, regarding number 10: Condition with the fold to the side. With the fold to the bottom it is still possible to trap air inside the fold, unless time is spent getting a good crease along the fold. This obviously wont work for techniques like Skinner blends or mica shift, where it is important to condition in one direction. When doing these use the good crease option. Yup, sideways works too. Before I heard this I used to just wad up the clay and shove it back into the top of the pasta machine. And I had a LOT of bubbles. Once I became aware of the problem it was easy to fix. I agree with the fold on the side and even more so after taking a class with Maggie Maggio. She recommends turning your clay one quarter each time when conditioning and always, always, always condition with the fold to the side. Her reasoning on this was that it is like plywood. When you condition in one direction, then turn and condition in the other direction, you line up the molecules in opposition which gives it more strength. Makes sense to me and unless I am doing a skinner blend, this is what I do. What if we don’t use a past machine? I make thicker jewelry and the machine gets it too thin. How do I eliminate bubbles by hand rolling it? Just make sure that when you’re rolling the clay, you fold it carefully so that no bubbles are trapped between the layers. If you see a bubble in the clay, you can slice into it with your blade, let the air out, and then seal it back shut. The only one I didn’t know was the Sharpie marker! Although I don’t use Sharpies on clay I was surprised since I’ve seen it mentioned in some tutorials. Hey, these are great! Thank you! I had no idea about Sharpie; I do indeed have tutorials saying to use it. Thank you for that warning! Excellent! Thanks so much for sharing these super hints! I remember you recently had mentioned using a pizza stone in the oven to moderate and hold the oven temperature more constant. Seems like a good hint. One of these days I’ll have to stop reading your excellent writing and actually try some polymer clay work! I said that? I must be smarter than I remember because that’s a great tip! I have heard of people leaving the stone in their oven all the time because it helps hold the heat and act like a buffer. And yes, you might have to start playing with clay. It’s soooo addictive. I had a LOT of 6 inch tiles left over from a reno project so I put 4 tiles on the wire rack of the convection oven in my studio. It helps hold the temperature and gives me a more consistent cure. Excellent list of things very interesting for the work with polymerclay. Thank you so very much for the share! I’d never heard of Sharpies being incompatible!! Thank you for sharing!! If your hands can’t stand the thought of an alcohol based sanitizer to wipe stuff off (or get the process started) use a hand lotion such as vaseline. Work it in well, wipe off with a paper towel then wash like normal. I live in a dry climate and by the start of winter my hands are a wreck from washing and regular use. And all good tips to use! I knew these but it took me a while to figure them out, generally by trial and error. Thanks Elaine, that’s a great tip to add. I’ve got lotion in my studio, right next to the hand sanitizer in fact, but I’d not thought of using it that way. I’ll have to do that when the old skin start to complain. I’m very new to using clay, so I needed all of the great tips. I read that u can also use plain un-scented baby wipes to clean machine/hands etc. Is this a good tip? No need to stick with unscented…if you prefer scented, go for it. But yes, baby wipes are a fantastic product to use with polymer clay. I even wrote a whole article about it here, in fact. I didn’t know about the nail polish or the Sharpie. Thanks, Ginger, for sharing all those things! I am making some stuff for a Vacation Bible School and since I am not at home and don’t have my glaze I was going to use nail polish! That would have been terrible! Oh no! That would have been bad! So glad you read this, then. A good glaze to use would be “Pledge with Future Shine“. Polymer clay artists have been using it for decades. It’s water soluble, won’t ruin the kid’s clothes, and you can buy it in any grocery or discount store. Reading that reminded me of another tip I’m not sure about, maybe you can help. I heard if u use a flat piece of black polymer and cover the top of a DVD r or the ones to download pics. Then paint on a coat of future acrylic floor shine, it will lift off just the film of rainbow that they have onto the black clay. I’m sorry for missing a few steps (which I have on my pintrest). My problem is that I have been trying to find the future acrylic floor shine for a few months. Any advice, I would love to try it. There’s definitely something lost in the translation here. The technique about the DVD is here: http://kreativ.fimotic.com/?page_id=3620. There are other, similar, tutorials. The idea is that you can lift the shiny foil layer of rewriteable CD’s and use it on polymer clay. A FAR easier method is to just use a sheet of metal leaf. Or even the kind of foil that’s used for making t-shirts. Once you apply the foil to the polymer clay, you can color it with alcohol inks to get the neat colors. After baking you can seal with any sealer. The thing about the Future acrylic floor finish is that it’s a shiny varnish that was really popular with polymer clay artists long ago when we all had vinyl no-wax floors in our kitchens and everyone had a bottle of Future on hand. It’s still a nice, easy, glossy finish. But it’s not terribly durable and if you’re going to go out and buy a new bottle of something, there are better sealers than Future. You can read more about sealers in my article here. I do prefer to use Varathane. There’s nothing magical about Future that makes this CD foil idea work any better. It isn’ called Future anymore. Johnson’s bought it out & and the clear floor polish is called Pledge All-Purpose. Don’t get the one for just wood floors, get All-Purpose. I did know that, I’ll try to change if I still call it Future anywhere. Though, I do want people to understand that old references to Future do mean the same product. I have such a large bottle of Future that I’ll never use it up, so to me it will always be Future. I see this post is from so long ago, but I have a question. What if already has been sprayed or used nail polish is a way to get the clay less sticky. Or to cover to seal it? If it’s only a tiny bit sticky, you can paint over it with Varathane to get a nice finish. But if it’s really goopy, then you’ll need to remove the sticky varnish. Try using isopropyl alcohol. It will likely dissolve the varnish, but also any paint on the surface. If it’s nail polish, you’ll need to remove that using nail polish remover. Which, unfortunately, will also dissolve the polymer clay. Didn’t know about nail polish or sharpies. Hadn’t thought to use white scrap clay for clean up. Thanks so much. I saw a video where you can make your own alcohol ink using the insides of the sharpie pens on you tube. I suppose if you needed a specific color or couldn’t buy the inks then that might be a good option. Interesting. And I guess they’d be really good for coloring translucent clay. I hadn’t thought of that. Learn something new every day! But if you used sharpies to make ink, wouldn’t that ink then degrade the clay too? Great tips, I read a lot but didn’t know about the sharpies, spray paint or ziplock bags! You had me there for a minute. I had to think about it. The problem with Sharpie isn’t that it degrades polymer clay. It’s that the dye inside diffuses into the clay and causes it to fade and/or blur over time. I really don’t know how compatible Sharpie guts are with polymer clay as I always use alcohol ink. I do know for a fact that you can color polymer clay with Ranger and Pinata alcohol inks. Honestly, Sharpies are kind of pricey to be chopping them up for their juice. Awesome! Thanks for the link. Certainly something to think about. It does look like a great way to get lots of new colors. Again, no idea how it works with the clay but it would be interesting to find out. Ive staggered on to your site by mistake, but Im so glad I did! I have just started out making polymer clay momentoes. I ‘seal’ them with a 50% pva glue and water mix first. Then I paint them a colour, but the acrylic paint makes them sticky and the sharpies I write with bleed and then don’t work after writing just one or two plaques Ive spent a small fortune trying and re-trying different ways, and Im just so frustrated. I have been buying Sculpey Clay and also I have nearly 2 dozen sharpies in different colours, but I really wish I didn’t! …What can I use to write coloured writing on my clay after baking? I was told by Hobbycraft that Sharpies were the thing to buy for my plaques!.. but they clearly aren’t. Also I seal them with a spray seal from Games Workshop… can you help me get these right? Hi Vanessa, I’m so glad you stumbled here, too! Welcome! Okay, here goes. First off, there is no need to seal polymer clay before painting. Try using Premo polymer clay (paint sticks to it very well) and paint with regular acrylic paint. Craft paint works well as does artist’s paint. You have to give the paint plenty of time to dry and cure, though, maybe 24hrs or so. Then heat set the paint by putting the figure in the oven at 200°F (93°C) for about 15 minutes. You don’t always need to seal the paint, depending on your application. The paint should stick and stay just fine as is. But if you want to seal it, try using water based polyurethane. In the US the brand name is Rustoleum Varathane. Make sure it’s water based!! It comes in quart cans but it lasts forever. Alternatively, you could use a spray sealer called PYM II (Preserve Your Memories II). It’s one of the few aerosol sprays that are compatible with polymer clay. Now for your pen. As you found out, Sharpies aren’t the way to go. They’re a bit hard to find, but Sakura MicroPerm pens work great. Pigma micron will work but sometimes can bead up and not write well on the plastic. Also you can try alcohol based Copic markers but I don’t know how well they hold up over time…they’re not all lightfast. I do hold some hope out for acrylic based markers that are now coming on the market but I’ve not tried them yet. The people at hobby stores, bless them they mean well, but they don’t always know the particulars of polymer clay. I hope this helps. Feel free to email and ask more questions if you need. There are also many great sources of information on Facebook groups and forums such as Polymer Clay Central. Good luck! But at the end of the day, it’s still a Sharpie. I’m confused, lol sorry. Me too! Not sure what you’re referring to here? Sharpie doesn’t work well as a marker on polymer clay because it fades over time. Someone was suggesting using Sharpie guts as a substitute for alcohol ink. Which might work, but it might also fade. I don’t know. I DO know that it does fade when used as a marker. See here: http://thebluebottletree.com/pens-to-use-on-polymer-clay/. Scroll to the bottom to see how Sharpie fades over time. I’ve learned too many of these tips the hard way 🙂 Hopefully you’ll shorten the learning curve for people. I would not use my polymer clay with out it, and have been using it for about 15 years, maybe more! I found other products dried out my hands, or I was always running to wash my hands and they got chapped. This product not only removes every bit of clay, it has softeners in it so I never had chapped hands. And I am not always running to wash my hands! Fantastic suggestion! I’ve never heard of using this type of cleaner for clay and that’s too bad because I’ll bet it smells wonderful! I had not heard or figured out the white clay to clean the pasta machine – YEA, Thank you. BUT … when I baked my beads in corn starch it kind of cooked into the beads and they ended up a “whiter” color than they were when I did not bake in corn starch. I have this happen, too, and I’m not sure if it’s actual cornstarch stuck to the surface of the clay or it’s just tiny little “spaces” created by the grains of cornstarch. Give them a good scrub with a toothbrush under running water. And then a coat of the sealer of your choice. That should fix it. Great tips, Ginger! I knew all but the Sharpie. Lucky for me I never tried it. I knew all of these except the sharpie tip. I’ve used translucent to clean hands, workspace, and machine, because it’s not as likely as white to leave some of itself behind, and on the rare occasion that it does, it doesn’t ruin a project because it is nearly invisible. Translucent is another great option and you’re right, probably better for many colors. The trans of most brands is usually a bit softer and stickier than the rest of the colors in a brand, so I’m not sure if that’s an advantage or disadvantage. Thanks for bringing it up. It’s certainly great to have more options. Great tips, and even though I’ve been working with this for awhile I learned something new! We forget that there are always new clay enthusiasts born everyday who may not know this. Thanks for sharing these tips! Thank you for sharing these tips. Didn’t know about Sharpie or sprays or nail polish. You saved me from some costly mistakes! I enjoy your site very much. Keep up the good work. I can say I didn’t know any of this and very happy to learn it. Working with polymer clay is on my to do list. I have an important question, at least for my household. We have exotic birds, when you bake the clay will the fumes harm our birds? We have to be super careful of air fresheners, etc. Thanks. I have heard discussions of this issue and I’m sorry to say that I don’t have a definitive answer. A solution that some people have found is to use a small toaster oven in the garage, that way there is no worry of the fumes hurting your birds. At the very least, you can bake your items covered in a roaster pan (or in two aluminum pans clipped together) and then take it outside before you open it. Maybe a reader knows some more information and will chime in here. Thank you, I hadn’t thought about the garage. I also have a parrot. Because of Gumby, I bake all of my clay in opposite side of house with open window. One time, thankfully at a class, someone mistakenly upped the temp on the oven to 400 degrees. Naturally everything burned….the fumes were noxious!!!!! If this had happened at home, in the kitchen, where Gumby lives, she would have perished, & we have had Gumby since she was an egg, almost 30 years! Thanks for the info! I’d love to see a pic of Gumby. 🙂 What about a bearded dragon? He’s about 1-2 years old, so he’s an adult. Do you think I should avoid baking polymer clay in my home? I also have two hound dogs, but they’re both over 35 pounds. My house is pretty small, so I don’t have the option of baking far away from the animals. All of the clay manufacturers tell us that polymer clay is not toxic, but they only certify that for humans, of course. I can assume that means it’s perfectly safe around animals, but that is just an assumption on my part. To be absolutely sure, you should probably contact the clay manufacturers. That being said, it’s a rare polymer clayer who DOESN’T have pets in their home and I’ve never heard of a case of an animal harmed by clay. So personally, I wouldn’t even hesitate. Clay on! Can the clay be baked in a gas oven? Absolutely. But depending on the oven, you might need to protect your pieces from spikes in temperature. I always bake my polymer clay items on a ceramic tile inside aluminum pans. That way they’re protected from the heat a bit better. You can read about that and see a photograph here. These are fabulous tips! I bought a heap of clay when it was on sale at MIchael’s a few weeks ago to use in a project at summer camp. These tips just saved me a lot of time! Thank you so much! I really dodged a bullet by reading your article!! I’m so glad to be helpful! Polymer clay is fantastic for summer camp. There are so many ways that all ages can have success with it, from the little ones making snakes and lumps to the teenagers getting really creative with applique and figurines. Have fun! Hi Dolores, welcome! Well you’re proof indeed that there’s no such thing as being too late to start doing what you want to do. I’m so pleased that you’ve enjoyed my site and please thank Marilyn for sharing! You might be interested in an article about my father. He is now 73 and after a life of working in farming and construction, he’s found his artistic voice. You guys are inspirational! This is all good advice which is excellent for polymer clay beginners. I too prefer to condition my clay by folding and placing in the machine sideways. The other thing is that I would recommend baking your clay pieces in baking soda rather than cornstarch. This is also what Donna Kato uses. The cornstarch is a finer powder than the baking soda and more difficult to wash out completely afterwards. Thanks for sharing these much needed and great tips! Yes, the baking soda is probably better for burying beads. I’m not gonna argue with Donna Kato, LOL! Cornstarch is a non-soluble particle so you might have to scrub it out. Baking soda dissolves, so it’s easier to rinse out. And honestly, I don’t use either. I bake everything in aluminum pans, so I never have to worry about it. Hi Ginger, I’ve just happened on your blog and immediately subscribed, it’s such a treasure trove! May I add my 2 cents here… I make miniature food and tend to bake my items directly on the tile I used to sculpt them, but it does leave them super shiny and smooth on the bottom, which is not always what you want. To avoid this, I use a scrap of parchment paper over the tile, but I also read about paper plates. Sometimes, though, even just a small cardboard tray (such as a box lid) will do perfectly. thanks again for such a wealth of great tips! Thank you Marcella. I love that you’re enjoying the site. And I’m glad that my info is valuable to people doing other types of polymer clay than just jewelry. I do use the paper trick, in fact, people who use my tutorials are probably tired of me saying “Set this on a scrap piece of plain paper.” I would think that parchment paper would be really good of the clay would be sitting on the paper for a while. Plain paper does tend to leach the clay a bit. Thanks for the comment and welcome to my site! I find baby wipes work well on stained hands and they work well on engine grease for car repairs. I just made my own bead baking racks from aluminum flashing (roofing material aisle of the hardware store). Thanks for more tips! We have red eared sliders around here in the creeks. They’re adorable! I see what you mean about how everything’s sea turtles and not cute turtles. I would think they’d be easy to do in clay, though, because you could cane the shell and the neck has stripes. If you ever decide to try making one, I want to see! Thanks for the reply Ginger. I have made 5 turtles this week with my granddaughter, but with my being a newbie, they aren’t very good. I am still learning canes, and so my projects aren’t good quality, but great therapy. I just used nail polish on some work…Do you know how long it takes to degrade? I’m so glad you posted that. Thank you. Oh no! I don’t know how long it takes as I’ve never used it. Maybe a couple months? But the good news is now you know and can use other finishes in the future, right? I hope your piece gets lucky, though, and stays looking great. Hi there!! I just discovered this great blog too! Thank you Ginger! I just wanted to answer to Kim…because unfortunately I did the same mistake with her, once. I glazed everything I had make with nail polish…and as the days passed everything got sticky and messy…it was a huge disaster. But because I wanted to do the experiment, I left them as they were for a couple of months.. But the nail polish never dried, it just became worst. What I did next, was to remove the nail polish with nail polish remover. Fortunately I managed to remove the nail polish and i saved all the pieces. I used cernit and fimo clay so I found that the best thing to glaze my creations is fimo glaze. I leave in Greece and until then fimo glaze was not sold in stores and I couldn’t find it online (it didn’t ship here) so I was experimenting with some other glazes but NOTHING worked.. I have never used the spray glaze Ginger suggested though..I don’t know if it’s sold here either. I’m late to the comments but thank you for these. I didn’t know any of them. I have hardly done much with my clay over the years and I’m just getting it out of the drawer again. I still have my first batch from 5 years ago. I haven’t done much rather than food miniatures. Oh there is so much to do! The great thing about polymer is that you can pick it back up again so quickly because it doesn’t really require that many tools. You might want to buy new clay if yours is crumbly, but dive in and have fun. If you have any questions let me know! what kind of glue can I use to stick the things I have made together, i.e. made some roses and want to paste them on plywood board which I have painted, kind of a basket I have made with the clay as well as the roses. To glue two pieces of polymer clay together, you can use liquid clay and rebake the piece. To glue clay to a plywood board I would think you could use E6000. But my favorite glue to use with polymer clay is 90 second 2 part epoxy that you get at the hardware store. It comes in two little tubes. You just mix equal sized drops together and then glue things together. Cures in 90 sec and works like a charm. I may have read this before,Ginger, but just read again! Thanks, this was so helpful! I was just wondering the other day how it might work to use a Sharpie on polymer! Now i won’t waste my time and money trying that approach! Thanks for telling me what WILL work instead! And thanks for getting me started with polymer clay! I’m so loving it! Oh Sharyl, I’m so happy that you’re enjoying working with polymer clay so much. I do enjoy seeing what you make and post online. You’ve got it figured out, that’s for sure! Nah, Sharpies just fade over time. And on some brands of clay it nearly completely disappears. PITT markers are so much better because they’re pigment based. Oh no! My boyfriend and I have really gotten into making figures with polymer clay lately and he has been spraying our pieces with. Krypton aerosol acrylic clear top coat as a sealer! We’ve been making sculptures to sell on Etsy, and now I’m afraid of the consequences! One of my pieces, the paint dried slightly tacky/sticky too. So I don’t know if I sealed it without letting the paint set well first. I checked out the PYM II that you linked, it’s too pricey for my budget just now, so I’m ordering the rust oleum varnathane that you mentioned in reply to someone else’s comment. LOL, I knew what you meant. In fact my brain never even registered that you’d typed “krypton”. Some people DO use that one and have no had bad results, so maybe you’ll get lucky. But I don’t know of anyone who has done controlled long-term tests with it. Sometimes sealer over paint can be an issue if there is an incompatability. Some paints stay sticky, too. The liquid varathane is awesome stuff. You’ll love it. As for the acrylic paint bubbling…you’d sure think it would, but it doesn’t! I now heat set by paint and sealer by just baking it at regular clay-baking temps (typically 275°F). I’m usually baking more clay and I’ll just add the painted pieces in for a heat cure at the same time. So far so good. And I do use liquitex basics sometimes, I find them a bit rubbery. For painting on polymer, I actually prefer to use el cheapo craft store paint. It’s chalky, it’s opaque, but it has good sticking power and typically dries well. And I typically seal it with either varathane (if necessary) or paste wax. You can get craft paint on sale at michaels for 50 cents sometimes, that’s when I stock up. How frustrating. Supposed got auto corrected to supported. I’m going to shut up now! Glad I found this. I was using the regular oil based spray matte finish to seal my works after applying pastel and mica powder. When I found this blog, I was searching for why some soft pvc plastic decorations got sticky a few months after customizing. I’ve had a few polymer creations get sticky within a year after making, but not all of them. Some of them I got lucky I guess. Anyways I am stopping and getting a water based sealer. Though I didn’t see any warnings against using the oil sealant sprays on air dry or cold porcelain type clays? I think it would be fine on cold porcelain and possibly air dry clay (depending on what it’s made of). Polymer clay is a plastic, and just as some paints will dissolve plastics, they can dissolve polymer clay. But the thing is, it’s not uniform. Some sprays do it, some don’t. Some clays have this issue, some don’t. So short of doing a comprehensive test over a long period of time (and then having the manufacturers change their formulas), it’s best to stick with a water based sealer such as Varathane (my favorite) or if using a spray, use PYM II. I also have a tip: you can soften polymer clay by adding a little water in it. It then becomes like “soft cream” and you can use it in many projects like miniature food. And the question: can someone use liquid glass on polymer clay? And if yes, how you do it? I tried it after I baked the clay but the liquid glass just destroyed the clay and it became sticky and messy.. I have never liked the effect when I add water to polymer clay, but then I use Premo and Kato. I know that Fimo acts very differently with water. It sounds like something I’m going to have to try. It might not work for all situations, but it might be fun to see exactly how it does act. Thanks for the idea! Is there an inexpensive polymer clay – or another similar substance – that can hold it’s shape in water? I’m hosting a craft for 150 girl scouts! I want to make snow globes – snowmen, glitter, and distilled water in baby food jars. We won’t have time to bake the snowmen, so we were planning on having the girls make their snowmen and then fill their “globes” with water at home after their snowmen have air-dried. I found a craft online that suggested using Sculpey (they claimed that it worked fine, even unbaked). I used a cheaper brand (Polyform), but it dissolved. I tried Model Magic – same thing happened. Do you think Sculpey would work? Or is there some other medium that would work? I’d sure appreciate any ideas. Thanks! Hi Amanda, I’m not sure what the cheaper brand you mean is, Polyform is the parent company of Sculpey. I don’t know how long you have to work with the girls, but it only takes about 30-45 minutes to bake polymer clay. Also, polymer clay doesn’t air dry, it will stay soft and workable (and mashable), so sending the snowmen home to fill the globes later seems to be unnecessary and they risk mashing their creations. Of course filling that many globes could be a problem, LOL. Any baked polymer clay will work and will withstand the water. Unbaked polymer clay might not withstand the water. Some brands (FIMO in particular) have a water soluble element that makes them dissolve over time. I would recommend Premo or Kato polyclay if you wanted to keep the clay in water. BUT, that would be very expensive on a scale like you’re talking. Here’s what I’d try. First, if you can bake the clay (or have them bake the snowmen at home), that would be optimal. Barring that, I’d try Plastalina modeling clay. I think it’ll withstand the water, but you might want to check. It doesn’t air dry either, it stays soft. As for the polymer clays, Sculpey original is the one I’d aim for. It’s cheap and I think it will hold up in the water. I just now checked to see if there was any stickiness when I add water to some I have here, and it seems to hold up fine (short term). I hope that helps. Good luck! Thanks so much for the info. After reading your reply I think I realized what the problem was. I used an air dry clay (Polyform Model Air) thinking that would do the trick, since we don’t have time to bake it. I think I’ll try the Sculpey – trying baking and no baking – and see how it works. And take your suggestion to have them bake at home, if necessary. Then, if all fails, I’ll try the Plastalina. Hi Veronica, congratulations on being able to take care of yourself through your illness. RA is a real drag (how’s that for an understatement). You might be interested in the new brand of clay, Sculpey Souffle, that just came out. It’s super, super soft and it will be easy on your hands. As for the faces, have you thought about using beads for eyes? That’s what Kater’s Acres does for her Parker figurines. You can make a mouth with a tool that presses one in. Maybe a cuticle pusher would have the right shape? Barring that, if you still want to use paint, then there are ways to stabilize your hand. Painters use something like this, but maybe you could adapt something similar that would work for you? Regardless, keep creating. Isn’t it truly wonderful how healing that art and creating can be? Best of luck to you! I have a question about polymer clay or fimo beads – if you were to make a bead and create a ring with that bead being the center would this bead material hold up to hand washing – water and soap? Oh no! I used nail polish as a color, then glazed over it. Do you think it will still degrade my beads?!? You might get lucky, but it’s hard to know. Some nail polishes don’t seem to have the chemical that softens clay. Unfortunately, only time will tell. Crossing fingers…. I know that you have mentioned to not use paint over already done clay; does that include acrylic paint as well? I did? I’m not sure what you’re referring to, because you can absolutely use paint on cured or baked polymer clay. (If I need to change the wording somewhere, let me know and I’ll fix it.) Acrylic paint is best because it dries fast. And some oil based paints will dissolve the clay and make it sticky. Sorry, I reread your tips. Because you had mentioned of “being aware of what paint to use”, I thought you meant to not use most of them. But yeah, I just wanted to know if acrylic paint was okay to use. These tips are really useful! For instance, i did not know I could use aluminum foil for my polymer clay. Great tips – thank you so much for sharing! I come back here every now and then to refresh my memory and read the new comments and tips from readers, and of course, your responses. I learned the hard way about Liquid Leaf (solvent based paint)… I was making some beads out of Super Sculpey for an Egyptian themed necklace and wanted to mimic antique gold (without the crinkles and expense that gold leaf affords) so I used Liquid Leaf. Four years later, the beads are STILL tacky and sticky. I kept them as a reminder lol. I find that Rub ‘n Buff works ok, but I’m still not entirely satisified with the realism factor. I have a Dremmel and was thinking about upping my game by wet sanding and buffing – I’ve read that is how to get a wicked shine on beads without using any sealants. Anyways, very wonderful site 🙂 Keep up the good work! Hi Sabrina, Yeah, Liquid Leaf isn’t a good one, LOL. Have you tried Inka Gold? It’s water based, kind of like a creme eye shadow, but you can buff it up to a quite realistic shine. Comes in many colors, too. But it does need to be sealed (PYM II works great for that). Wet sanding and buffing will totally give you a super smooth surface and yes, you can get a very nice shine that way. But because polymer clay is really soft, it doesn’t stay shiny. It always goes back to a nice warm, soft glow. Very tactile and satisfying feel to it. BUT…you can sand and buff to get a good shine and then a coat of sealer will protect the surface, keeping the shine even longer. Or you could just buff periodically. Ginger, that is so good to know (about how PC doesn’t stay shiny)! I will go ahead and use a sealant on my bead projects. I’ve never tried Inka Gold – looks like a cross between Rub ‘n Buff & Perfect Pearls! I’ve often wondered if one uses a sealant, then a solvent based paint, & maybe another layer of sealant, if the clay would be protected or if solvent would still leach into the clay. I may have to experiment! Yes, it is kind of like Rub n Buff but with mica instead of metal. But it is less waxy and more water soluble. Rub n Buff is more permanent. As for layering, I think it depends on the solvent and the clay. Some solvent based paints actually do work with clay…other dissolve the clay itself….others just refuse to dry. So it’s really hard to make generalizations. Experimenting is always a good idea, I think! Hi, I am a newbie at this.. I want to start making little animal figurines. Which Polymer Clay do you suggest I get for this? I will be purchasing a small convection oven for my baking process and thermometer. Is it as easy as create and bake? No need for sanding or buffing or glazing right? Thanks for all your informative tips in working with Polymer Clay.. Please advise which clay everyone is using for such a project. Hi Rose, Make sure that you use a strong clay for making figurines. I’d recommend Premo, Kato, or Fimo Professional. Make sure you avoid Sculpey and Sculpey III as they’re pretty brittle if you make any little thin parts like arms. Sculpey Souffle is a new clay on the market that is really easy to work with and quite strong. Yes, it really is as simple as make and bake. But make sure that you do test your oven first to make sure the temperature is holding correctly. Also, cover your items so they don’t get toasted in the oven. No, there’s no need for sanding or glazing unless you want to make them super glass-like shiny. Or if you need to seal in powders or mica. You’ll learn as you go along, of course, and the best way to do that is to just roll up your sleeves and start. Enjoy!! Amazing all the helpful information here plus comments. The suggestion using cornstarch to bake the beads is great to know since I had problems with scorching of some clay pieces. Appreciate the link to this site. Great information, i am passing this on. I have used nail polish to give iridescence to my reptile creations and haven’t had problems yet. Keeping my fingers crossed, but it’s been 10 years. Maybe the amount and the placement had something to to with the longevity. It’s probably fine now, I wouldn’t worry. I think only some combinations of polymer clay and nail polish brands lead to problems, but without doing exhaustive tests, it would be almost impossible to figure out which are the bad combinations. FWIW, though, there are some really nice iridescent acrylic paints out there. Golden has a line of artist’s acrylic paints that have some wonderful iridescent colors. Wow, I’m on my way to setting up an etsy shop and I’m surprised I didn’t know that you can’t use spray paint or nail polish. Pretty much everything I’ve made is coated in either nail polish or Krylon spray paint. Is there any way I can take these coatings off so all these pieces aren’t ruined? Also, about glazes, I have a few questions if you don’t mind. About future (or pledge floor polish or whatever) as a glaze, I’ve heard that it’s ‘not completely permanent’. What the heck does that mean? It’s going to eventually wear off? I would hate to sell something beautiful and glossy only to have it wear off once the customer got it. Also, I have seen people using the kind meant for wood, when I was under the impression you were supposed to use the multi-purpose one? Does it matter? Also, about varathane, I’ve seen different types of it recommended. Some say to use the diamond kind and some say to use the heavy use formula kind. Does this matter at all, as long as it’s water based? ONE more question, about baking paint; that sounds super dangerous and toxic-like. Is that really safe to do? Thank you SO much if you do answer this gigantic wall of questions. I would be -so- grateful. Like I said, I want to open an etsy and I gotta get all these ducks in a row and it’s a huge bummer to me finding out that the Krylon spray coat shouldn’t be used (since that’s what pretty much everything I’ve made is coated with). I’m so glad I found your site, it’s been super helpful to me (obviously, lol). All your posts I’ve read are so well written and informative. Hi Chloe, I’m on vacation, so a quick reply here. You might be able to remove the bad finish by using nail polish remover, but of course, that risks ruining your pieces. Future isn’t “permanent”, well, that just means that it’s really thin and not very tough. So the shine wears off fairly quickly. There are many far more durable coatings and varnishes than future/pledge. If you’re in the US, get Varathane, you don’t be sorry. It is a fantastic, durable finish. I wrote about Varathane and show the right one to get here. Baking paint sounds dangerous, but you have to realize that clay temperatures aren’t really very hot. The paint doesn’t bubble and burn. I always bake my paint and sealers afterward, to set them. It really does make them stick better. One thing to mention, though, is that polymer clay doesn’t actually need a sealer. It is durable on its own, and is more durable than any sealer you will put on it. The only reason you need a sealer is to seal and protect mica powders, surface treatments, foils, or paints. Or if you need to change the shine level of your project. In other words, to make a shiny piece matte or a matte piece shiny. Some people had had good results with nail polish and krylon clear spray, so it’s not a foregone conclusion that your will degrade. Before you offer anything for sale, wear it, use it, give it a good testing just like a customer would do. That will tell you how the piece holds up. Sorry, I hope you don’t have too much time invested in those pieces. But now you’ll be on the right track and have reliable results. Good luck! I’m getting ready to help my 10 year old make some doll food. We tried using this clay a couple of years ago to make buttons. Her hands couldn’t old up to get the new clay softened. It was very hard for me to work, too. We didn’t get any buttons made and gave all of our clay away. She wants to try again. Do you have additional tips for working new clay w/a ten year old? Hi Debbie, old and hard polymer clay is no fun for anyone! Luckily, not all brands have this problem. If you can find a new brand called Sculpey Souffle (I wrote a review about it here), I think you’ll be pleasantly surprised. It’s very soft and easy to work, it’s very strong after baking, and it comes in some really nice colors. I would avoid Sculpey III. Even though it’s fairly soft and easy to work, it can be very brittle after baking. If you can’t find Souffle, then my next one to recommend would be Premo. But make sure you give the package a squeeze before purchase so that you don’t get stuck with a hard one. You can find Souffle in Joann stores. How much give does a new pack have? Playdough like? Our first purchases didn’t give much at all. I assumed it was like real clay and just took a good working…. Souffle is very near to Playdough in its softness, but with a smidge more body. That is its blessing, and its curse. It’s too soft for many polymer clay techniques but will be great for children’s crafts. Premo is quite a bit more stiff but shouldn’t be too hard for a 10 year old’s hands. My kids played with it from a very young age. It sounds like the stuff you got before was old and hard. Also, if she decides she likes it and wants to make some of the complex miniature food like PetitPlat, you’ll probably need a stiffer clay than Souffle. But I’d try a few bars of that first, then switch to Premo if you find the Souffle too soft. At first glance Petitplat looks more complex. Those look great. I think you’re just about to have a whole lotta fun. 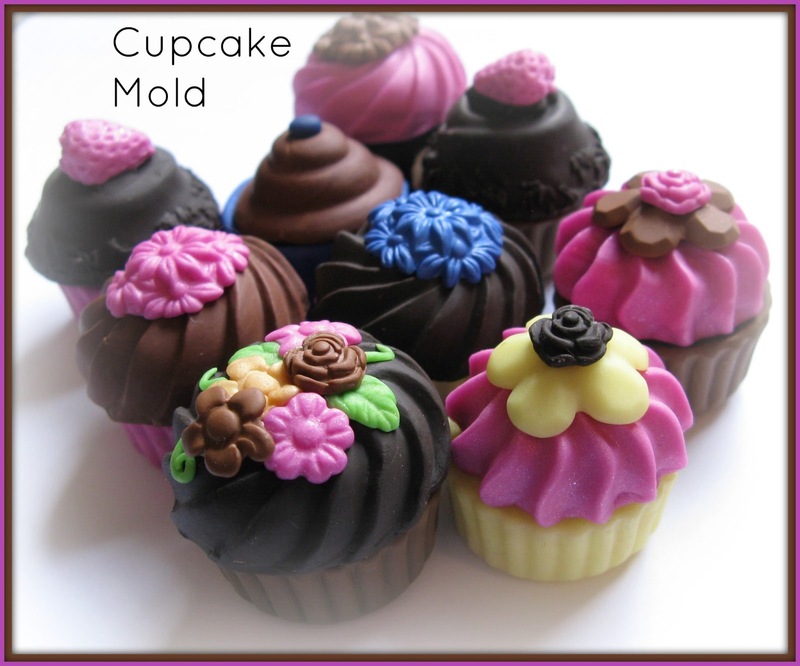 One little tip…if you use silicone molds, you can bake the polymer clay in the mold itself. That means you don’t get distortion that you get when trying to take raw clay out of a mold. Enjoy! You can use artist’s oil paints mixed in with the white clay to color it, but adding very much will thin the clay and make it too mushy. You can also use alcohol inks mixed in with white to change the color. Also, acrylic paint. But sometimes the acrylic paint won’t mix smoothly, it will give sort of a swirled or granite effect, which can work nicely, too. If its ok with you, may I link this article on to an article on my blog ? Aw, thank you Shilpa. You’re more than welcome to share the link, please do! Boy, am I ever exasperated!!! I wanted to print out the 10 tips, so what do I get? A thousand pages of all the remarks and answers. NOT HAPPY about using all that paper. In the future when you print web pages, you can avoid this problem by highlighting the section you want to print, you can click on “selection only” in your print dialogue and only the selected section will print. It’s a standard feature in Windows for sure, probably in Mac as well. If a piece is coated with gesso (the waterbased acylic used to prime painting surfaces) could oil paint then be safely used? Thanks! Hi Kenni, if you’re talking about regular artist’s oil paints in the tube then yes they can be used on polymer clay. There’s no need to undercoat with gesso. But I wouldn’t use oil based paint that comes in a can because there are so many other chemicals involved (and they vary from brand to brand) that it’s a bit of a roulette whether it will work or not. This being said, most of the time when people use oil paints on polymer they’re doing sort of a glazed effect, rather than a heavy opaque treatment. You’re using Sculpey Original, which is white, so that tells me you might be looking for more solid color coverage. For that I would suggest an acrylic paint. i ran my clay thru the pasta machine with the paper, didn’t see any bubbles whatsoever, worked on my pieces, baked, and now i see large bumps on the pieces – the are ruined (i spent lots of time added pearl ex prior to baking. i don’t know what to do other than trying to bake them with something heavy on top but i’m not sure what to use that won’t wreck the pieces and will fit in my toaster oven…any ideas?? Unfortunately, this is pretty common. Sometimes gases dissolved inside the clay itself will form bubbles during baking. We call those “the bumpies” or “pimples”. So frustrating! The only solution I know of is to bake the clay upside down (the the gases rise to the back not front), but that can affect the texture of the surface. Some brands do this more than others. Premo is notorious. On the other hand, if they’re big bubbles, could it be because you laid it down directly on a ceramic tile to bake and the bubbles are between the clay and the tile? Next time, put paper between the clay and the tile. That allows air to escape. As for your finished piece, you could weight it down with a ceramic tile (depending on the shape of the piece) and bake it again, leaving the tile on it until fully cooled. But make sure you put down paper first so you don’t get shiny spots. thanks for the suggestions. i will try both – upside down, and adding a tile on top and see which one works for me – hopefully one does! it’s so disappointing! What I do when I want to make sure something stays flat is to bake it sandwiched inbetween two tiles. I put paper on the bottom tile, lay my item on it, lay paper over the item, then another tile, flat side down. Then bake, adding some extra minutes to give the tile time to get up to temp. After baking I remove my item as soon as possible from the paper, so it doesn’t stick, but put the sandwich back together and let cool. Great article. You’re right it felt good to nod and say ‘I knew that’ but I still learned quite a bit. Especially the Sharpie tip. I use it all the time without any problems. Hi Ginger, this is an amazing site, so helpful and inspiring! My question is about molds (apologize if you have answered elsewhere). I am wondering what materials can be used in the oven along with the clay that will release the clay easily. Will metal and glass work, or do you need to coat things with cornstarch or some other medium? I have been making little round boxes using a plastic toy ball that happened to roll under the kitchen table to shape the clay around, but even with cornstarch, pulling the uncured clay off without damaging the designs has been agonizing. Metal and glass can both be used in the oven to shape polymer clay, yes. Clay sticks pretty tightly to smooth things, but you can often pop it off after baking by sliding a blade or spatula under the edge and breaking the seal. You could also use foil between the ball and the clay. Also, two part silicone mold putty is non-stick. It could be formed into a ball shape and then used as a form. Thank you for these helpful tips. It’s always nice when someone shares things when others don’t. My name is George–Not Georgia,,Not Georgina, and Not Georgie. Am I the only male in your group of polymer subscribers? I have great admiration for the work you are doing. You have opened new window for me to explore. No, you’re not the only male around here. While the polymer community does tend to be overwhelmingly female, men are a valued part of the group as well. Feel free to speak up and join in. We’re glad to have you here! And thank you for the kind words. Polymer is a great world to explore for sure! For how long (is there a maximum duration of hours or days?) can I let my polymer clay creations stay at room temperature before I cure/bake them? I’m making several pieces and I want to bake them at the same time to save time and electricity. Also, Can i bake several pieces on the same tray side by side? Yes, you can save up your pieces on a tray and bake them all at once. I do that all the time. There’s not really a limit to how long they can stay. Just know that if they sit a few days you might find them hard to work on again if you need to change them…the clay might “settle” a bit and become less easily blended. You might find your piece will crack rather than “move”. But if you’re done with them, they can stay on the tray indefinitely. Just make sure they’re covered to keep dust and lint off them (and in my house…fur). And make sure you don’t have them sitting on paper, which will leach out the oils. Also be aware that a soft clay might get a shiny, flat spot on the bottom from where it conformed to the tray. Oh that is always the most frustrating bit isn’t it! There are two parts to this. One, preventing the lint, and I discuss that here. The other is removing the lint before baking. You can often removing it by using a Q-tip dipped in rubbing alcohol, nail polish remover, or medical spirits. After baking, the only thing that removes it is sanding (very fine grit) or using 100% acetone on a Q-tip. But be careful on the last one as it also dissolves the clay and can obliterate fine details. Good luck! Hi sorry im probably going to ask a stupid question but, I wanted to make faux floral glass bead out of polymer clay. I was wondering could I place organic flowers (dried) onto a made bead backing (polymerclay uncured) and place a thin layer of translucent clay on top (not making contact with dried flowers) and bake it? Or would it cause toxic chemical fumes? There are no stupid questions! There will be no toxic fumes. You can embed dried flowers in polymer clay…people do that all the time with flowers from funeral arrangements and weddings. To place the flower on the surface, I’d use liquid Kato Polyclay to “decoupage” it onto the base clay. Should work nicely. Have you ever heard of unbaked polymer clay getting moldy? I had started a sculpture and placed it in a plastic container to store it (and keep it from getting dusty) – then life happened, and by the time I got back to it (several months later), it had mold growing on it. I’ve searched the web but have been unable to find ANYTHING on this – is it still safe, and what’s the best way to clean it off (and prevent it from happening in the future)? Yes, I have. It will happen if the clay is kept moist and without fresh air. If it’s just a couple of spots, I’d just scrape it off and not worry about it. But if the whole thing is covered, please take care of your health and do as little as you can to disturb it…it must be thrown away. Remember that mold spores in your lungs can cause pretty nasty illness. In the future, store your in-progress polymer clay sculptures lightly covered and not tightly sealed. In general, it’s better to go ahead and bake a partially completed sculpture than to store it. You can always add more clay and keep going later. Surprised how few people know you can put Super Sculpy in hot water to bake it, and get great results with NO chance of scorch/burn marks. That’s because it’s not a suitable curing method. You are correct, there’s no chance of burn marks. But temperature of water can never exceed 212°F (100°C), even in a 500 degree oven. (It’s a fact of physics…water has to have a state change before it can increase to that temperature…it must turn to steam.) And that is not a high enough temperature to properly cure polymer clay. It might look hard, but you’ll find the clay is not fully fused and will be very brittle. I read, above, that nail polish is a no-no on poly clay. What about acrylic paint. I have noticed that it stayes sticky even when thoroughly dry on my cardboard creations. Will it stay sticky on fired poly clay? Most acrylic paints work well on polymer clay, but once in a while one will remain sticky. This is why it’s always a good idea to test them. If you get a sticky one, just choose another paint. I had an epiphany about nail polish on polymer this afternoon while at the beauty supply store: while looking at nail polish, I noticed that one said it was an acrylic polish and safe for artificial nails. Lightbulb! I’ll bet it’s polishes like those which work on clay, as opposed to the standard enamel. That’s prolly why you come across the rare fimoteuse who says she successfully uses nail polish on clay: she’s using an acrylic polish and not an enamel. I usta wear artificial nails yet never twigged to this in spite of the fact that I searched out acrylic polish to wear with eh. I guess my old brain jettisoned that info when I started wearing my nails naturally, without tips. It’s still a bad idea (nail polish doesn’t wear well), especially considering there are sooo many better alternatives, but I thought I’d float this idea past you to try to explain why a rare few successfully use polish. It might be difficult to roll foil that thin. I’d just use wire. And yes, steel wire is perfectly fine in the oven. I’d use stainless, though, as regular steel can rust. I’ve never used Model Magic, but I’m pretty sure it’s an air dry clay and not polymer clay. I really don’t know the answer, sorry. Model Magic is indeed an air dry clay. However, doesn’t matter what kind of clay you’re using on your project, either it’s air dry or polymer, I wouldn’t suggest using clear nail polish to seal them. In the long run the project will become sticky, especially when being exposed to heat (sun, hot temperature, etc.). I think it’s just a matter of practice. I do get a fingernail ding once in a while, but they’re really rare now. For one thing, I seldom handle the clay with my fingertips. I use the flat pads of my fingers. And when I sculpt or shape the clay, I use tools for sculpting, not my fingers. It does take time to learn a new way to handle the clay, but taking care to pay attention to how you’re working will pay over time. I would like to make a little watercolor plein air kit using sculpey clay to make the paint wells. Do you know if the sculpey will react with the watercolor paint in it? I put it in the wells & let it dry. Then I use a damp brush to get paint as I need it. Sculpey is just vinyl, so it will not react to watercolors (which are just pigment and a simple glue). But the pigments might stain the Sculpey. Sounds like an interesting project. Hey there, I was wondering if you could substitute tin or aluminum foil for gold or silver leaf in makume canes? Probably not. Aluminum foil is too thick and it will be impossible to slice. Metal leaf is incredibly thin and easily slices within the cane or slab. My daughter made beautiful ornaments from polymer clay and sealed them with something that has remained sticky. Is there anything I can put over that to get rid of the stickiness? If it’s just a little bit sticky, you can often re-coat it with Varathane or PYM II and it will be fine. But if it’s super sticky like tar then it won’t work so well. How long will ot take for nail polish to make the clay sticky? I jist started making earrings and I used a sparkle polish on them topped with a resin. Am I going to have issues with that? Hi Ginger, I am new to making jewelry using polymer clay, I am baking it in my oven with a baking sheet but it seems like the clay that is laying flat and touches the baking sheet becomes shiny or melts? I don’t know how to prevent this from happening. Any tips? I wanted to start making some things with clay and my husband bought me a pack of Art skills Crafters Closet oven-bake clay. I dont know if it’s polymer or not. It was very hard when I opened it but knew from reading that I would need to knead it and work it a bit. It did soften up but now its VERY soft. I want to make flowers and small figurines but this stuff is so soft that my petals droop. What type of clay does this sound like? Is there anyway to make it hold its shape better? Are there different types of clay for different types of projects? If so what would a clay this soft be good for, molds maybe? I really wanted an air bake clay. And I plan to buy some more this week but if I can use this I’d like to. If I cant use this for flowers which kind – oven bake, air dry, polymer etc should I use and is there a cheaper brand you would recommend for Just starting out with? I dont wanna buy a really expensive clay and ruin it learning lol . I just found your site and have learned so much already! Thank you for sharing all that you do and for any help you can give me! I’ve never heard of that brand of clay. It sounds like one of the many no-name or generic brands available in kits on marketplaces. They’re usually very hard, then very soft, then too mushy to do things with. I would recommend getting some Premo and use that for making things. It’s a good all-purpose brand. You can still use the other stuff, but use it for bases, cores, and things that don’t require much fine detail. You can add Premo to the other clay and bake it together. They’re completely compatible. I have 2 questions. If I was to use the polymer clay on a turn table to maker a vase could I use water to help shape it or would it meets up the clay? And the other question is.. when I paint with my acrylic paint I have a spray paint varnish that I use that is for acrylic,oil and water colors. ” krylon kamar varnish 1312″ will that mess up the clay like normal spray paint or not. I use it for all my paintings on canvas and wood. Things like that but I’ve never used it on clay. Polymer clay is not water-based (you don’t use water with it) and it can’t be thrown on a wheel like pottery. No, never use spray varnishes on polymer clay. Kamar Varnish is a particularly bad one. See the article here.